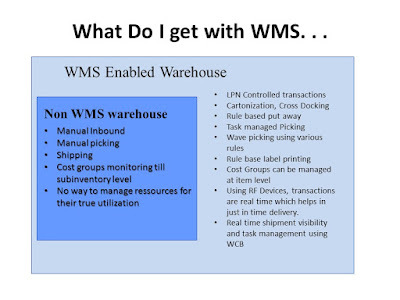 Both Inventory and WMS modules are used to hold the inventory and do transactions like receiving and picking goods but WMS is more expensive then inventory coz WMS has got some important premium features which is not there in Inventory module. 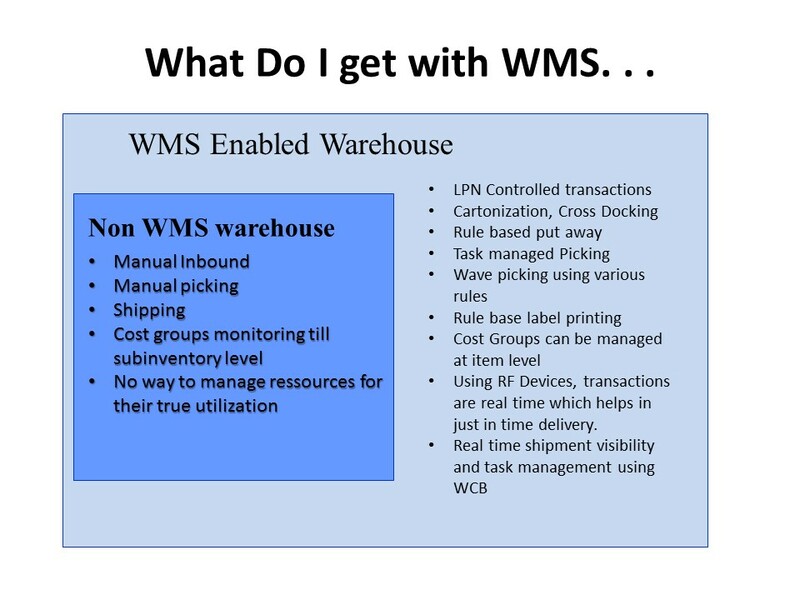 Inventory without WMS is basically small in size and where the granular level management and information are not required like labor cost, resource cost, etc. For example small shops or small manufacturing units who basically holds the stocks and ship it to their customer where not much of resources involved from warehouse point of view, they can simply fulfil their business requirement by using the Inventory module but if you will consider big transportation companies like UPS, DHL or big retail or FMCG manufacturing companies who manufacture thousands of products and they have their warehouse worked by number of resources, machines maintained by various departments and spread across large locations, they cannot fulfil their business requirement by simply with Inventory module, they need bit more detailed analysis of warehouse resources, cost, efficiency, effectiveness and want to track the time and labour to fulfil the customer demand in a more efficient and cost effective ways then need to go with Warehouse Management System which comes with all these features. WMS comes with rule workbench which makes warehouse management lot easier and efficient by defining different rules, pick rules, putaway rules, label printing rules. WMS provides cost involved in granular level in different tasks like shipping, picking, fuel costs by machine, labour costs, etc. From finance or accounting point of view, suppose business maintains a line of products (more than one number of products but in one line, suppose a health care company in its hair care product line makes different products like 100 ml, 200 ml bottles, 10 ml sachets) stores in one subinventory but want to get valuation accounting details for each product. It is not possible by Inventory as in inventory all products are comes under one accounting which is defined in subinventory but the same can be derived in WMS by using cost group rule. So in Inventory module, accounting details canot be given down the subinventory level but in WMS it can be derived in many different levels, in locator level, lot level, supplier level, etc. Lot more features are there like operation management, task dashboard where warehouse manager can check each and individual resources and how much they are occupied, according he can assign the task to complete in timely and cost effective way which is lacking in Inventory. From technology point of view, Mobile devices enabled with RF can be used with WMS, so that means you can do transaction in real time on the go when you do physical movement, you can do the same in system and also get the required label printed on the go. But in Inventory these are two different tasks, you have to physically do the transaction then need to come to the machine and do the transaction in system. In big warehouses where everyday thousands of transactions are happening, this is not a cost effective or efficient solution. But with WMS, all these things will be ease. Inventory system and POS control software is a powerful, scalable Point-of-Sale and Inventory Management software solution with integrated e-commerce that allows you to maintain absolute control of retail of your business.